SAOR started as a free-standing, studio-only project from Scottish multi-instrumentalist and songwriter Andy Marshall accompanied by a variety of session musicians. The other unofficial members of the group are mostly folks who play instruments that are welcome in the Folk Metal style like the fiddle, the bagpipes, and even someone who just plays the bodhrán, a skin drum traditonaly used in all Irish and Scottish music. They made their impressive entrance onto the Black Metal and Folk Metal scenes beginning with their first full-length release from 2013, "Roots". With their 2014 album "Aura", the band started getting a much more serious focus from critics and fans of Atmospheric Black Metal albums. Shortly after the release of "Aura", Marshall took SAOR on the road to a few select gis around Europe. 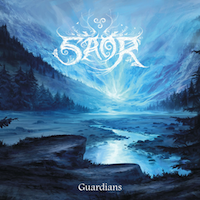 But SAOR has ultimately decided to focus on studio work which shines through with their latest release "Guardians". The natural beauty of the Scottish Highlands get perfectly captured by the atmospheric instrumentation of the record. And not only on the bagpipes and fiddle, but in the spaciness of the guitar tones and the speed of the drumming. SAOR creates music where the Scottish identity and Black Metal go hand-in-hand with one another. Fans of AGALLOCH, MOONSORROW or WINTERFYLLETH will gravitate to this music quickly if they haven’t already done so by now. There is also a Cascadian Black Metal element to parts of this music as well. But some of those other parts are heavily influences by Progressive Rock, traditional Celtic Folk music and even guitar tones you would expect to hear in Jazz. Meri Tadić really killed it on her fiddle performances on "Guardians" and "Hearth"! You gotta hand it to SAOR for writing songs that tactically use bagpipes to their advantage. These instruments, how and when they’re used in these tracks, capture the natural beauty of the Scottish landscape enough to where even the laiman audience member can see the valleys and mountains quite clearly in their minds as they hear these songs. My biggest hangup on this record is the vocals. Andy Marshall is a great Metal vocalist, in my opinion but his problem is not so much talent but stylistic misappropriation. What I mean by this is that his vocals just don’t fit the atmosphere of every other part of the music. The exception, of course, being his clean vocals which we can hear on the track "Hearth", which fit the music excellently. But his NAPALM DEATH-style barks don’t seem to fit the grandiosity of the music to me, personally. This album was a great pleasure to hear. SAOR extends their talents far beyond mediocrity. It is mandatory to be moved by music this passionate and strong. The Scottish patriotism throughout this album calls us all back to the Highlands of Scotland despite where you may actually come from. There is something so mystical about that place that it leaves a stain on its countryside and people; People who can use this mysticism to enchant their music. I think that even after you listen to the album once, continued listenings will cause "Guardians" to grow on you. This is another glorious release that I think anyone willing to get over the vocals will enjoy. This was a very solid album and shows that SAOR outdid themselves from what they sounded like on "Aura" but it is just not quite a masterpiece.